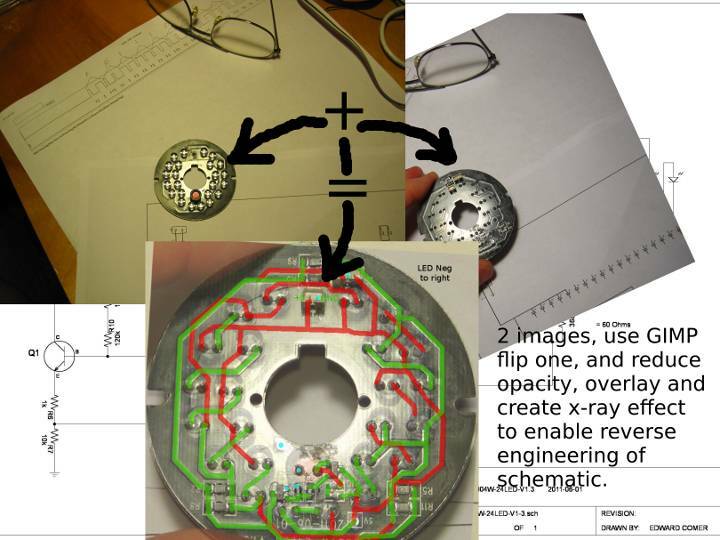 Years ago an orthodontist friend of mine, Neil, who was, by night, an electronic enthusiastic, used to reverse engineer printed circuit boards (PCB) by x-raying them in his office x-ray machine. In this way he could see simultaneously see both the PCB’s front and back traces and easily follow traces with vias, and through-hole interconnection. Recently, while reverse engineering a printed circuit board with installed components that I didn’t want to damage, flipping the board from front to back and trying to not lose a trace path was proving to be very difficult. It became so frustrating that I wished that I could use an x-ray like my friend Neil. It dawned on me that I had access to something almost as good – the GIMP (GNU Image Manipulation Program). I used my digital camera to take two images – one of the board’s front and another of the back. The photos were taken about eighteen inches away, under a strong light and at an angle to the light so as to get a lot of surface reflection. Normally such reflection would be objectionable but it is needed to make the circuit traces more visible and being at an angle to the light creates some edge shadow which also increases trace visibility. The distance was necessary to allow the reflection from the point-source illumination to spread over the entire PCB surface. Once I had two good images I used GIMP to combine them in layers to create a single overlayed image. The image on the upper layer was flipped horizontally and its opacity was reduced to 65%. The result was an image that looked much like an x-ray. Then, using two pen colors, one for each layer, I could easily follow every trace, even through vias and through-hole connections. Now, need to physically examine the PCB was minimal, and only required when the trace was obscured by a component. See the process in the image below. This entry was posted in Electronics, graphics, hardware, software and tagged gimp, graphics, xray. Bookmark the permalink.